This easy beef stroganoff recipe is made with low-fat cream of mushroom soup, London broil steak and sour cream. 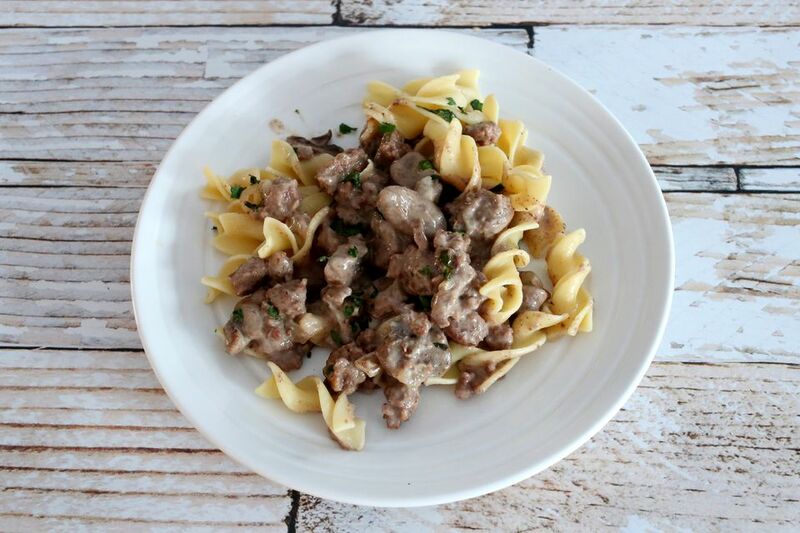 Beef stroganoff makes a satisfying and flavorful meal, and the preparation couldn't be easier. There's no need to brown the beef in advance, Just slice it and combine it with the remaining ingredients. The browning sauce -- Gravy Master, Kitchen Bouquet, etc. -- adds some color to the sauce, but it is optional. This makes a delicious meal with hot cooked noodles, or serve it over rice or mashed potatoes. I like broccoli with the dish, but green beans, carrots, and peas are all good choices for side vegetables. Combine the sliced steak, soup, onions, mushrooms and browning sauce in the slow cooker crockery insert. Cover and cook on low for 6 to 8 hours, or until the beef is tender. Add sour cream about 20 minutes before serving time. Serve over hot cooked noodles, mashed potatoes, or rice. Sprinkle servings with chopped fresh parsley. Use sirloin or sirloin tips in the recipe, or use browned ground beef. As you brown the ground beef, try to keep it in 1/2- to 1-inch chunks. If you are not a fan of mushrooms, make this with condensed cream of celery soup and omit the mushrooms.